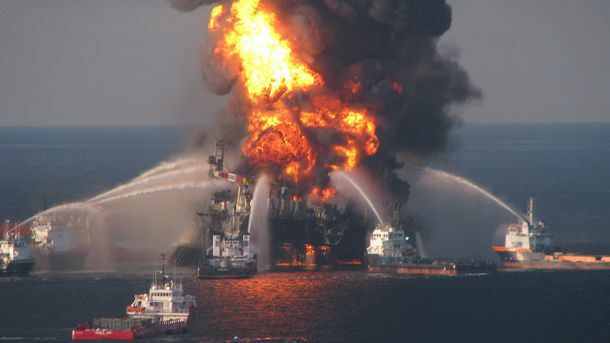 The 2010 Gulf of Mexico oil spill is a tragedy of enormous proportions that will impact communities and be studied by scientists for many years. Use the resources on this page to help your students better understand oil drilling and the impacts of oil spills. Each activity features film clips, maps, and photography from National Geographic’s collection of online articles and visuals about the Gulf of Mexico oil spill. Materials created with the generous support of Oracle. An illustration supplement from the September 2010 issue of National Geographic magazine depicting coastal and marine ecosystems in the Gulf of Mexico. The illustration addresses damage to ecosystems and dangers to organisms from the 2010 Deepwater Horizon oil spill. A downloadable map supplement from the September 2010 issue of National Geographic magazine showing the extensive network of oil and gas wells, pipelines, and platforms found in the Gulf of Mexico. How does oil affect feathers? What are the different types of plants and animals living in the Gulf of Mexico ecosystem? What was done to clean up the oil that spilled into the Gulf of Mexico in 2010? How effective were those efforts? After oils spills, should humans rescue, rehabilitate, and/or relocate wildlife? With exclusive access to BP's clean-up operations, National Geographic investigates what happened to the 4.9 million barrels of oil that poured from the sea floor in one of the worst environmental disasters of all time. From the front lines of the cleanup efforts, National Geographic follows the first two months after the spill, tracking cleanup efforts as experts seek to learn the ongoing effects and BP battles the spill and the public outcry. Read the October 2010 National Geographic magazine article that asks the question: Is another Deepwater disaster inevitable? Find photos and articles on the worst oil spill in U.S. history to date. View photos from the aftermath of the 2010 Deepwater Horizon oil spill. After the worst oil spill in U.S. history, nature has shown surprising strength—but the long-term damage remains to be seen.